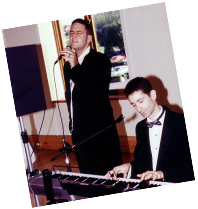 For the past twelve years I have been regularly working as a wedding pianist and singer. During this time I have developed a good understanding of what is required for the civil ceremony, reception drinks and Wedding Breakfast. When providing live music for a wedding, I am able to create the right musical mood, ranging from romantic and mellow to upbeat and lively depending on the particular stage of the days events. Prior to the Wedding day, I am happy for the future Bride and Groom to give me song requests and a general idea of their musical preferences. I am also able to advise them on choices of music for the wedding ceremony. Music choices are an opportunity to personalise the ceremony and make it unique, with contemporary song choices or a more traditional approach with classical music and Wedding Marches. I will also give the couple an opportunity to hear me play particular songs or pieces of music when required to help with the decision making process. On the day itself I also appreciate the importance of having a good rapport with the guests, sometimes encouraging an element of audience participation at an appropriate time (towards the end of the Wedding Breakfast for example), helping to create an even more friendly and lively atmosphere. 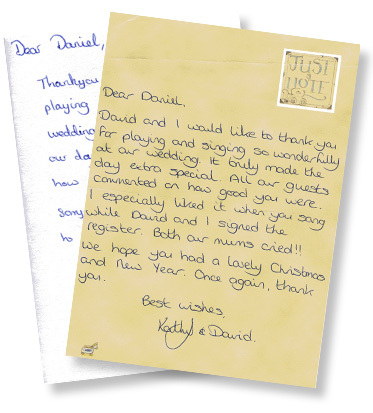 "I just wanted to drop you a line to say a BIG thank you for such an amazing performance at our wedding. We thoroughly enjoyed it and everyone kept commenting on how amazing you were. Our day was very special but you made it even more so. Thank you so much once again. Kind regards Holly and Neal"
To see further testimonials please Click here.